Thought to have originated in parts of Southeast Asia, its exact origin is unknown. Today the rambutan is found growing throughout the tropics. The rambutan is closely related to such tropical fruits as the longan, lychee, and mamoncillo. The exterior of the rambutan has an unusual, red, almost ‘furry’ appearance, but the interior resembles the lychee nut. The flavor is similar to the lychee, longan, and grape. The name for this fruit derives from the Malaysian word for ‘hairy’ (rambut) which aptly describes its appearance. 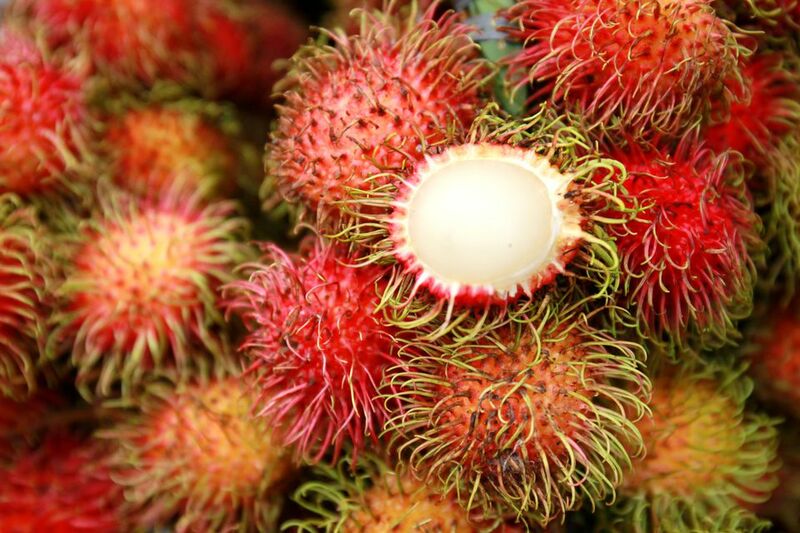 In Viet Nam, the rambutan is termed ‘chom chom,’ which means ‘messy hair.’ While the fruit is ripening it is covered with a spiny green outer skin, which turns long and red when fully ripe. Interestingly, the rambutan remains fresher longer when harvested with the branch attached. Traditional medicinal uses include boosting energy, relieving anemia, reducing pain and keeping the skin supple and young. All of the rambutan plant is used, from the root to the skin of the fruit, the seed and leaves to relieve such ailments as dysentery, diabetes, fever, and hair loss. While traditional medicine has held that the seeds of the rambutan are poisonous, no such toxicity was discovered in laboratory studies. In another study, rambutan was shown to have a pain relieving quality. A study conducted by the Chiang Mai University in Thailand discovered a number of flavonoids in rambutan, which are believed to act as anti-inflammatories with anti-cancer and antioxidant properties. The rambutan is rich in vitamins A, B and C. Minerals include iron, calcium, potassium, phosphorus, manganese, zinc and magnesium. Rambutans are also a good source of the natural sugars sucrose and fructose. Low in fat, the rambutan’s calories are derived primarily from its carbohydrates, which boost energy. The rambutan 404 is low in calories with about 60 per fruit.